"We are only like dead walls or vaulted graves, that, ruined, yield no echo. Oh, this gloomy world, in what a shadow or deep pit of darkness doth, womanish and fearful, mankind live. How came Lysandus by his death? In a mist, I know not how. Oblivion not come yet? Shut up mine door and keep out its gray skies. I'll move it nearer by a perspective, or make a glass that shall set all the world on fire upon an instant. I cannot sleep; my pillow is stuffed with a litter of porcupines." Little is known about Nulfaga's early life. She was a noblewoman; though it isn't known from where, she kept a castle, Shedungent, deep in the Wrothgarian Mountains. Nulfaga was Queen of Daggerfall during the reign of her husband, Arslan II, and Dowager Queen and Queen Mother upon the ascension of their son Lysandus to the throne. In addition, Nulfaga was a noted sorceress, sometimes described as a mystic, witch, or necromancer. During one of her astral travels in 3E 401, Nulfaga discovered the resting place of the Mantella, a gem that served as the power source of Tiber Septim's ultimate weapon, the colossal Dwemer automaton known as Numidium. For centuries, the Blades had been reassembling the golem after its destruction at the dawn of the Third Era, and the Mantella was one of the final pieces needed to reactivate it. Nulfaga informed Emperor Uriel Septim VII of her discovery, but refused to divulge its location—within the Mantellan Crux, a plane of Aetherius—unless the Emperor assured her the result wouldn't damage her son's power. However, the matter soon took a back seat to a quickly brewing conflict. 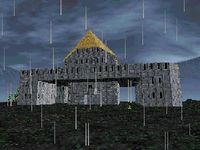 In 3E 402, a land dispute between the kingdoms of Daggerfall and Sentinel threatened to erupt into war. The queen mother and court sorceress Medora Direnni (who was secretly King Lysandus' mistress) both foresaw doom for Daggerfall and Lysandus. The king ignored their advice, however, and the War of Betony commenced. As the war progressed into 3E 403, all the major victories went to Daggerfall. Spirits were high among the king and court, but Nulfaga was unmoved. Queen Mynisera had learned of her husband's affair and banished Medora from court in his absence, and Nulfaga decided to leave as well, withdrawing to Castle Shedungent in the Wrothgarian Mountains. 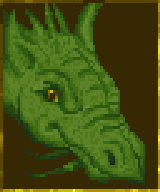 The dowager queen left behind her dragon familiar Skakmat to report on happenings in Daggerfall. Lysandus was troubled by his mother's departure enough to make an attempt at peace; this turned into a bloodbath and set up the final showdown at Cryngaine Field. The battle was joined when a thick, unnatural fog settled upon the battlefield, blinding the combatants. The mist was created by Skakmat, on Nulfaga's orders, in a last-ditch effort to prevent her son's death. When it lifted, however, King Lysandus lay dead, his throat pierced by an archer's arrow. The news of Lysandus' death drove his mother mad with grief, a situation made worse when his ghost began haunting the streets of Daggerfall. The dowager queen locked herself away within Shedungent, experimenting in magical studies with no regard for her own safety. In 3E 405, the Emperor sent an agent of the Blades to investigate why his old friend Lysandus' spirit was restless. The agent was sent by ship down the Bjoulsae River to the City of Daggerfall, but upon crossing the Iliac Bay a storm of "supernatural strength" suddenly hit and wrecked the ship upon a rocky promontory. The storm was indeed supernatural; an unknown individual had learned of the agent's mission and convinced Nulfaga that the ship carried the murderer of Lysandus, so the witch conjured the storm in her madness. The agent survived the storm, and eventually visited Shedungent numerous times. 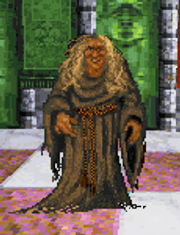 The first was at the behest of Queen Aubk-i of Daggerfall, who was worried about the dowager queen's health and mental condition (she was alive, but still lost in her grief). Medora also required the agent's assistance; she had retreated to the Direnni Tower on the Isle of Balfiera after her banishment, but Mynisera placed a curse upon her which trapped her inside. Breaking the curse required a great unicorn horn, and the sorceress sent the agent to Nulfaga to see if she could help. However, her mind was still broken, so the agent ventured into Shedungent and stole the horn for Medora. Once the curse was lifted, Medora and the agent were able to soothe Lysandus' spirit enough to learn his assassin's name, Lord Woodborne of Wayrest. The agent exposed and took down Woodborne; Lysandus' spirit was able to rest at last, and Nulfaga was able to regain her senses once again. Lord Woodborne had once possessed the Totem of Tiber Septim, an artifact that would allow a noble bearer to control Numidium. 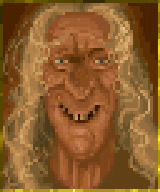 He had planned to use it in a bid for power, but before his death the Totem had a new owner—Woodborne's co-conspirator (and Nulfaga's grandson), King Gothryd of Daggerfall. The agent retrieved the artifact from the Castle Daggerfall treasury, and a bidding war quickly ensued among the major powers of the bay. The agent chose a bearer (incredibly, seven powers appear to have simultaneously received the Totem). The Mantella, still resting within the Aetherius, remained the only piece needed to activate Numidium, and Nulfaga then sent the agent to the Mantellan Crux to retrieve it. Upon the Mantella's return to Tamriel in 3E 417, Numidium sprang to life as seven realities converged in the event known as the Warp in the West. It is not known what became of Nulfaga following these events. Nulfaga is listed as a Redguard in TES II: Daggerfall.